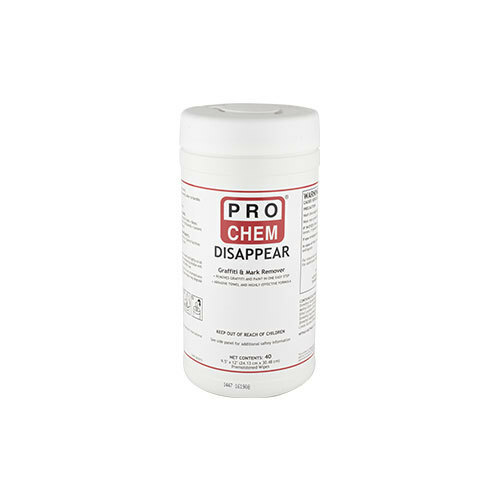 DISAPPEAR | Pro Chem, Inc. DISAPPEAR wipes are a quick and easy way to get rid of graffiti from non-porous surfaces. These wipes are premoistened with an incredible cleaning formula that removes paints (including enamel), ink and even permanent marker. A few swipes with a single DISAPPEAR towel is all it takes to quickly dissolves away unwanted paint and graffiti. Contains no amyl acetate or methylene chloride, making them less hazardous for users as well as surfaces. Unfold towel and lightly scrub in a circular motion to begin dissolving paint and graffiti. Wipe up any remaining residue with a clean cloth. Repeat if necessary. NOTE: When using on prepainted surfaces, initially test in an inconspicuous area to make sure paint is not removed along with the graffiti. these wipes may degrade certain plastics.